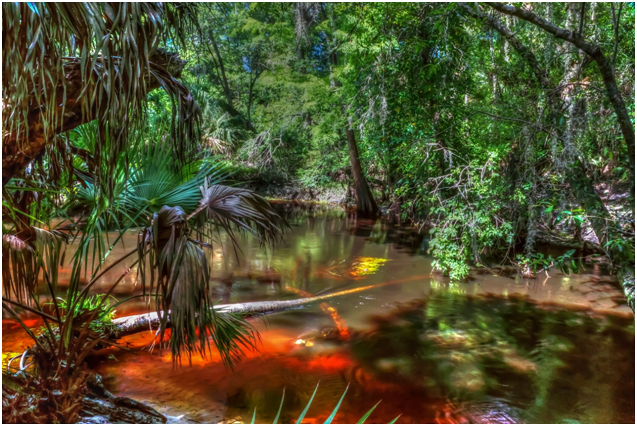 Cocoa, FL—A Photograph by local photographer, Ed Quillian, was selected to be among the 55 pieces of artwork out of 218 total submitted in the "100% Pure Florida" exhibit, located at the 5th Avenue Art Gallery. The gallery is located at 1470 Highland Ave. Melbourne, Florida. The 8th Annual juried exhibition will start on September 3 and go through September 29, 2013. The opening reception date will be Friday, September 6, from 5:30 to 8:30 p.m. where the public can meet all the artists and photographers. “Primitive River'” is the title of the image taken while on a "day photo trip" to the "Little Econlockhatchee River", located outside Orlando, Fl. The overall length is 21 miles, where the river goes from a swampy backwater cypress tree area to a sandy bank clear water river, and is one of the northern flowing watersheds in Florida.